[font=Georgia]In the last decades of the Dwarven race, the Dwemer of Skyrim were at war. 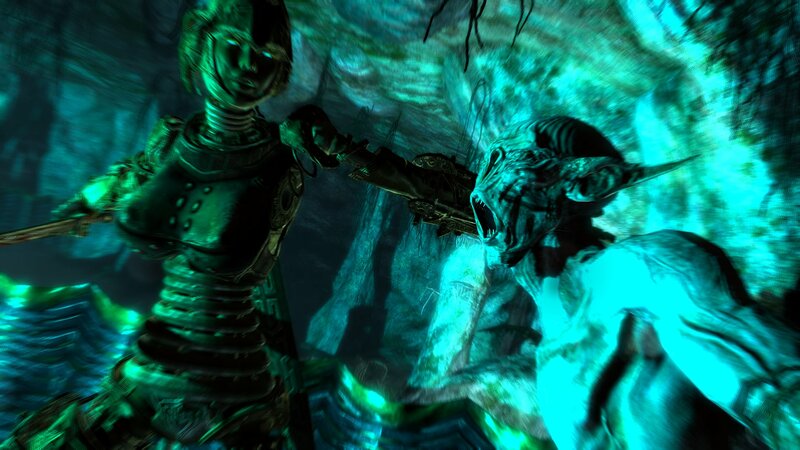 The remnants of the conquered Snow Elves revolted against the cruel masters who had blinded and enslaved them centuries before, and the Dwemer found themselves facing an implacable enemy deep within the heart of their workings. Seeking a new weapon to beat back this rebellion, a certain clan of Dwarven researchers built upon earlier experiments to find a way to combine the signature achievement of the Dwarves, the Automaton, with the combat talents of the Falmer’s natural enemy, the Nords. [/font][font=Georgia]The pinnacle of this effort was the Modular Automaton design, a model of humanoid construct featuring interchangeable body parts to allow for a wider variety of fighting styles than existing automatons were built for, with the minds of the Dwarves’ human test subjects implanted into them to take advantage of their more flexible tactical thinking. Plans were made to seize warriors from the human cities and use them as the basis for whole armies of these brass soldiers, and after sweeping the tunnels clean of the wretched Falmer perhaps they would have been returned back to the surface to subjugate it in the name of the Dwarves as well. Fortunately for the Nords of Skyrim, the Battle of Red Mountain put an end to every Dwarven scheme. Only a few prototype production lines had been constructed before the Dwemer vanished from Nirn, with only a small number of unfortunate test subjects left behind in the empty laboratories. And perhaps due to the predilections of the researchers behind the project every one of these test subjects was a woman. The designs for the male warriors were never produced, and only this initial ‘Maiden’ series was completed before the end. No one knows where these lost projects were hidden. Few even had a hint that they ever existed. But recently, something happened to change that. The last soldiers of the Dwemer are finally seeing the light of day. The subject’s head can be implanted onto the Automaton body directly, or further supported by a neck frame (slot 45) and enclosed within a glass dome (slot 31). Alternatively the brain itself can be removed and encased within glass or armored capsules in a replacement head structure (slot 30). It is also possible to copy the subject’s mind into one of an array of crystalline matrices (slot 43) and mount that into a purpose-built frame. Faces copied from ten of the original test subjects were produced for the replacement heads, with fifty different expressions in three materials- flesh, cast brass, and stone- for one hundred and fifty available options (slot 44). A ‘null’ face consisting of just the eyes is also provided, along with two animal-based masks and a wide array of head coverings. The upper torso (slot 32) functions as the foundation of the construct, containing a Heart crystal that binds the Aetheric Body that provides motive power to the machine, the processing elements for the magi-magnetic joint system that allows the construct to exercise a wider range of motion than it would physically be able to employ, and mana storage tanks to replace the magicka pool of subject’s original body. A variety of models were produced in differing armor designs and capacities. The lower torso and hips (slot 49), arms (slot 33), and legs/feet (slot 37) are divided into three main types with two limb sub-types. Alternate versions of the pelvises are provided to allow for a degree of interchangeability between leg types, as well as legless ‘unassembled’ versions for decorative purposes. [*]Type B – Based on Nisetanaka’s Dwarven Bikini Cyborg[/url], this type’s pelvis features a skeletal design for more inhuman Automatons. It comes in Model B for use with the Type B legs and Model E for use with Type E-based legs. Both versions of the original Bikini Cyborg design’s legs are available, as well as a new ‘short’ type without the height adjustment. The ‘disassembled’ option lowers the character’s height to the level of the Model B leg caps, allowing for legless locomotion. Several combinations of normal and weapon arms are provided. [*]Type E – Based on Edhildil’s Dwemer Cyborg sets, this type adapts the Dwarven Centurion’s pelvis for a bulky, robotic design. The Model A version uses the original design’s Centurion-based legs, with assorted feet provided for them. The Model E version is based on the updated design, with skeletal legs connected to a mid-thigh cap. Versions of these legs with the different foot options are available, as well as a ‘disassembled’ option set to the Model E height. [*]Type G – Based on Vicn’s Dwarven Gynoids, this type features a pelvis and lower torso elaborately built up into a stylized humanoid shape to pair with the original design’s human-like legs on the Model A version. The various original Gynoid feet are available for use with this model, as well as a new high-heeled design built for use with either this or the Type E legs. The model B and E versions of this pelvis also feature more humanized proportions. Additional swappable armor pieces are provided for use with the Type G arms and Model A legs. [*]Type CR – Animal-themed limbs based on the Dwemer Dog and elements from the Dwemer Steam Horse models, for use with the Model E pelvises. Come in Beast and Pony versions, and are paired with matching tails (slot 40) and animal-based masks. [*]Type DD – Based on MaikCG’s Dwarven Devious Cuirass[/url], and arm and leg set for use with the Model E pelvises. Has a matching Core unit taken from the same design. [*]Type NULL – These tokens block off the head, hand, or foot slots, allowing you to have headless or limbless automatons without the original human body parts appearing. Does not block any actions. 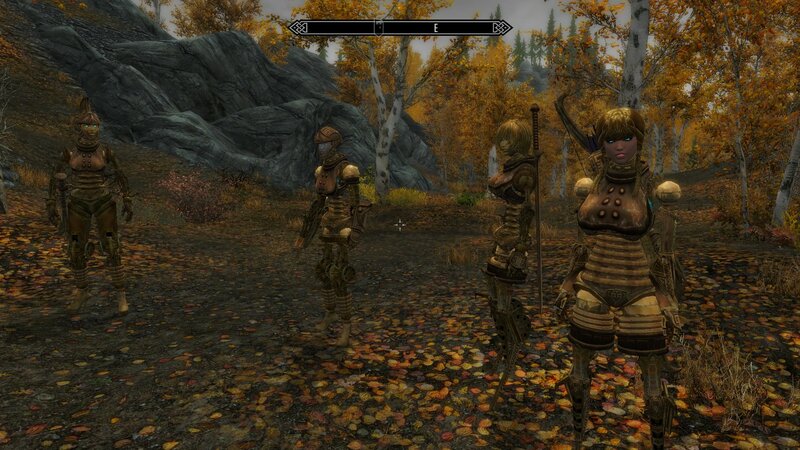 Invisible ‘style’ versions of the Dwarven one-handed weapons are provided for use with the Type B and CR weapon arms. A full set of duplicate vanilla Dwarven weapons is also available, these have had their speeds raised to simulate the physical boost provided to an Automaton. All body parts can be dropped into the game world. Install as usual. Reuses texture paths from Dwarven Cyborg Collection[/url] and SeXtreme Loading Screens[/url], so may prompt for overwrite on some files if those mods are installed. No changes to the textures were made, so this can be allowed or ignored at your leisure. XPMSE is required as some parts of its extended bone set are utilized. Racemenu is required for the NiOverride height system. In-game crafting is not provided, for various reasons. Can be searched for in the console under ‘DMA’, but the number of results may exceed the console’s backscroll. Use of AddItemMenu is advised. To change a character into an Automaton, a Core Unit must first be equipped to replace their original body. From there the pelvis and limbs can be added. Floating hands and feet will be visible until parts using those slots are equipped. Parts are not intended for use without a Core equipped, and will look messy if used so. Head elements, however, can be used independently from the body system if desired, although the masks are intended to be used only with the replacement head units and will look even more messy without them. ‘NoStrip’ keywords are applied to all parts. SE version? Yes, with thanks to TheBobbyLlama﻿﻿ for the conversion. What body does it use? 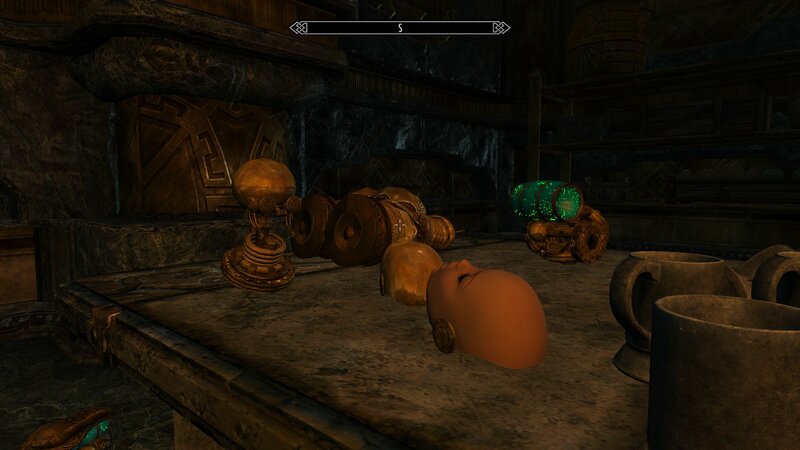 As a complete body replacer that uses no skin textures, Dwarven Modular Automaton is effectively body-agnostic and can be used with any installed body type. Male versions? Due to the mods the majority of parts were sourced from being female-only, male-use options are not provided. [*]While the Head Preservation Dome elements were built with full Beast race support, the bodies themselves were not. Khajit and Argonian characters will have their tails remain on the Automaton bodies unless replaced with one of the Type CR tails. [*]Parts were arranged to minimize clipping and distortion, but all possible poses or animation sets could not be accounted for. Some oddness may occur in more extreme positions. [*]As the parts were built with the LE UUNP HTD weighting, unsure if the slight motion added to some parts of the Type B and G pelvises using that weighting will carry over to SE or other body types. [*]The Pony mask is malfunctioning in the SE conversion. Cause unknown at this time. The Amazing World of Bikini Armour!